Back when it was cold enough for ice sculptures and even an ice castle. It’s time for the Saint Paul Winter Carnival, featuring parades, pageants, an art show, a cat show, a beer tasting, and more. What more proof do we need that Winter doesn’t keep us from going out, especially when it’s been so mild we don’t even have ice sculptures? For music lovers, this week holds an embarrassment of riches, From elegant jazz to elegant blues, with some joyful noise for all. We’ve got jazz with African influences, Brazilian music with jazz influences, new compositions, and traditional tunes. Music for dancing, and music for listening. These suggestions are but a few ways you can take part, one way or another. Babatunde Lea, Adam Linz, & Zacc Harris @ Cafe Maude, 54th & Penn, Minneapolis. 7pm. Lea brings a sense of joy to his African percussion, Linz holds down the groove, and Harris supplies some tasty licks. As usual at Cafe Maude, it’s a good idea to get reservations for dinner, and tell them if you want to sit near the band. Merciless Ghost @ The Black Dog Coffee & Wine Bar, Saint Paul. 8pm (tip jar). More adventurous music at the Dog, from Merciless Ghost, a jazz trio dedicated to group improvisation: George Cartwright, sax; Josh Granowski, bass; and Davu Seru, drums. 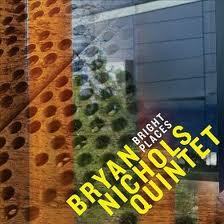 Bryan Nichols Quintet @ The Artists’ Quarter, Saint Paul. 9pm ($12) I know I wrote about Nichols‘ performance of the music of Keith Jarrett a couple of weeks ago, but this time they’ll be doing his originals. And what a band. If you want to know the Young Turks of the Twin Cities music scene, these are the guys: MIke Lewis & Brandon Wozniak, saxes, James Buckley, bass, and JT Bates, drums. Monk in Motian @ Studio Z, Saint Paul. 7pm – 9pm. ($10) Bassist Matt Peterson will have his work cut out for him as he supports three drummers (Pete Hennig, Davu Seru, and JT Bates), two saxes (Scott Fultz, Brandon Wozniak), and two guitars (Zacc Harris, Park Evans). Inspired by drummer Paul Motian, they’re tackling the music of pianist Thelonious Monk, which is adventuresome to start with, and using a piano-less lineup to add their own doses of creativity to the mix. This is part of the Jazz @ Studio Z series. Here’s a video of an earlier version of the band. Moonlight Serenaders and Pippi Ardennia with Irv Williams on Saint Paul Live!, KBEM 88.5FM. 7pm – 8pm. The big band sound of the Serenaders at Wabasha Caves and Irv Williams delightedly playing with Pippi Ardennia at The Landmark Center. Both recorded live this past Summer and Fall. Phil Aaron @ Jazz Central, 407 Central Av, NE Minneapolis. 8:30pm. (Donation) Elegant piano playing from Aaron as the featured player this week while house pianist Tanner Taylor takes a break. The basement recording studio/rehearsal space “by cats, for cats” is always fun. It’s BYOB. You can hear some of Phil’s music here. Jack Brass Band @ Driftwood Char Bar, 44th & Nicollet, Minneapolis. 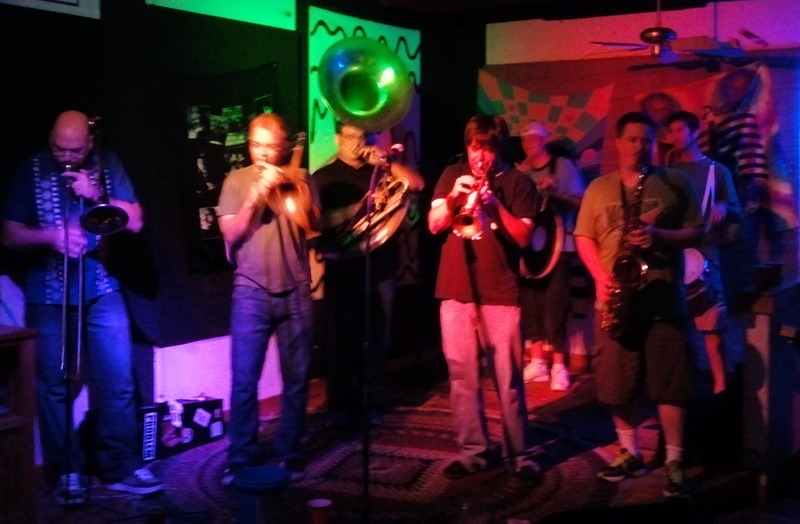 9pm (tip jar) Alway fun, this New Orleans style brass band can strut the traditional stuff, but will throw in songs by Marvin Gaye, Hugh Masakela, the Tempts, and Dizzy Gillespie. The Driftwood is a beer & wine joint, with pretty good bar food. For a comprehensive listing of Jazz in the Twin Cities, go to the KBEM Calendar, here. For further commentary on Twin Cities jazz check out the blogs Jazz Police, Bebopified, and Jazz Ink. Nikki & The Rue-Mates @ The Black Dog Coffee & Wine Bar, Saint Paul. 7pm – 9pm (tip jar) I know a number of my readers are big fans of this group, and would want to know of this appearance, which is in a relatively new place for them. A little bit of psychedelic folk, a little bit of country blues, and a whole lot of terrific playing and singing. Radio Joe & the JazzBos @ the Eagles Club #34, 25th & 25th, Minneapolis. 8pm ($5) Guitarist and vocalist Joe Demko (Willie & the Bees, Bruce Henry) leads this quartet in and evening of swing, boogie-woogie, and jump blues for your listening and dancing pleasure. Other members of the band include Bruce Wintervold, vibes, Keith Boyles, bass, and Tony Gusetti, drums. Twirl, jump, and dip to your hearts delight. Nellie McKay @ The Dakota, Minneapolis. 7pm ($35) The always witty, always literate Ms McKay presents a new show, “I Want to Live” based on the story of Barbara Graham, the third woman to be executed in the gas chamber at San Quentin. Leave it to the irrepressible McKay to weave humor, pathos, and entertainment into such a story. Lil’ Ed & Blues Imperials @ Famous Dave’s, Uptown Minneapolis. 9pm ($5) I wouldn’t be surprised if Calhoun Square begins to glow with the heat generated by this slide guitarist, who ably carries on the tradition of his uncle, JB Hutto. Charlie Parr with The Hobo Nephews of Uncle Frank @ Bayport BBQ, Bayport A two-fer of songwriting excellence that exemplifies the roots explosion here in Minnesota. The Nephews chuggin, folk rock approach contrasts nicely with the stark acoustic blues of Charlie Parr. Plus, you’ve got some pretty good que. Gang of Mischief @ Neumann’s, North Saint Paul. 4pm (tip jar) It’s the last Sunday of the month, and harpmeister Hurricane Harold is gathering up a group of musical friends for an afternoon of playing. The Gang’s roster changes from time to time, but often includes folks like Papa John Kolstad, Mike Caravale, Dan Schwalbe, Good Time Willy, Steve Kaul… You get the idea. Eric Bibb @ The Dakota, Minneapolis. 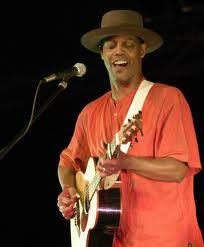 7pm ($20) If there is such a thing as elegant acoustic blues, then singer Bibb more than fits the bill. He’s a soulful performer and storyteller, and as a result has been nominated for a Grammy and five Blues Music awards. This entry was posted on Wednesday, January 25th, 2012 at 8:42 am and is filed under Weekly Preview. You can follow any responses to this entry through the RSS 2.0 feed. You can leave a response, or trackback from your own site.